Calling all patients, friends and family. 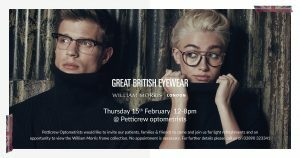 Drop in, enjoy a glass of Prosecco or cup of tea or coffee and try on a selection of hundreds of frames from our lovely rep William Morris rep Ashley Kerr. Ladies, Gents, Sunnies all available. No appointment necessary. We will even give your existing glasses a sparkling makeover while you wait. Please spread the word – we would love to see you! « The Ultimate in Recycling!